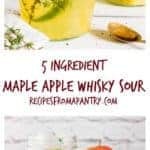 This Maple Apple Whisky Sour Cocktail offers a fun fall/autumn twist to a classic Whisky Sour and is whipped up with just 5 ingredients. No special equipment is needed. 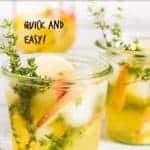 It will make the perfect addition to any drinks or supper gathering. Suitable for Gluten-Free and Vegan diets. 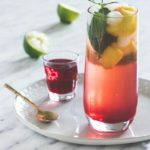 Delighted to have teamed up with thebar.com to bring you this recipe. Although it is a sponsored partnership, all opinions are my own. Because it is autumn and fall and now more than ever we need long easy suppers to catch up, share good food and drink and generally avoid thinking about the changing weather. Enter this brand new Maple Apple Whisky Sour Cocktail. Or should that be a Thyme Maple Apple Whiskey Sour? You get the flavour point though, right? What I love about this maple apple whisky sour is that it is super quick to make. It is a whisky sour without a shaker so needs only everyday equipment so easy to whip up. Plus, it comes seasonal flavours that celebrate autumn and winter. 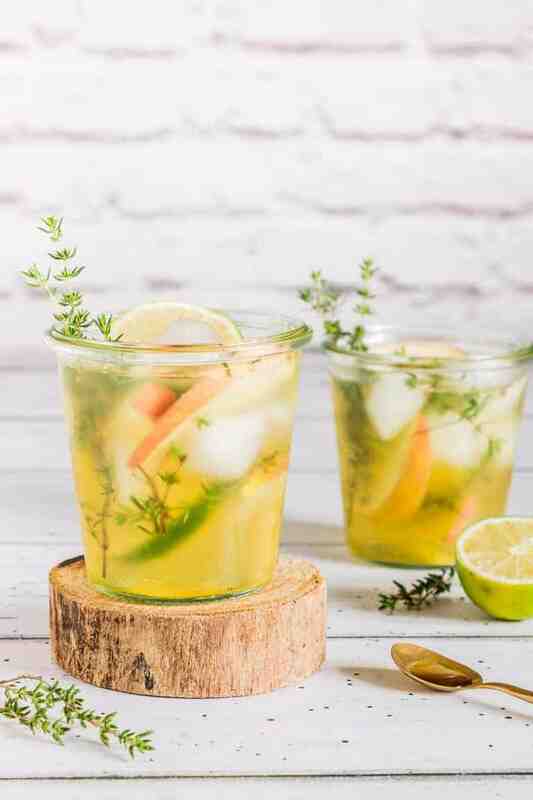 The apple juice adds a light fruitiness to the cocktail whilst the fresh thyme infuses a gorgeous citrusy aromatic scent and taste. The rich caramel tones of the maple syrup are the perfect finish to this. 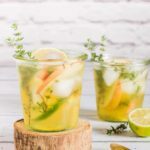 This drink is a great to twist to a classic whisky Sour, is easy multiplied up and pairs well with several food types, so will make the perfect addition to any supper gathering. Step 1. 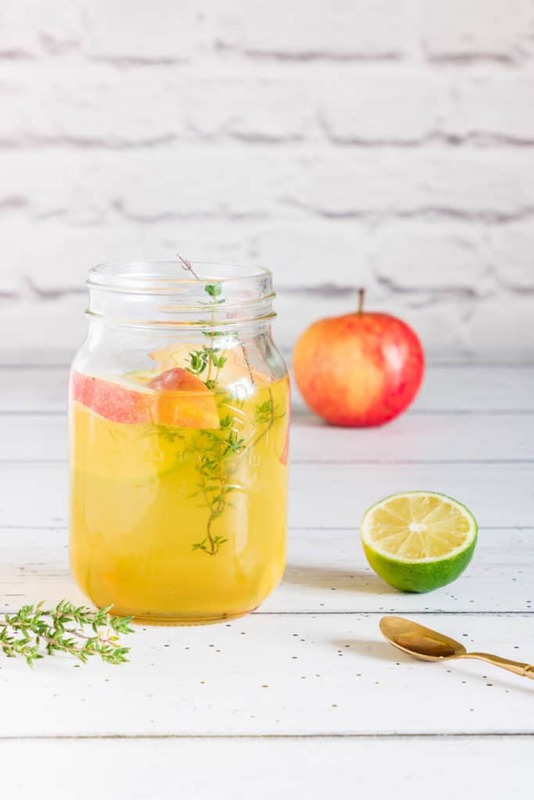 Mix the whisky, apple juice, lime juice and maple syrup in a pitcher. Step 2. Then add in the thyme and let infuse for 5 mins. Step 3. Fill 2 glasses with some ice and pour in the maple apple whisky sour. Step 4. 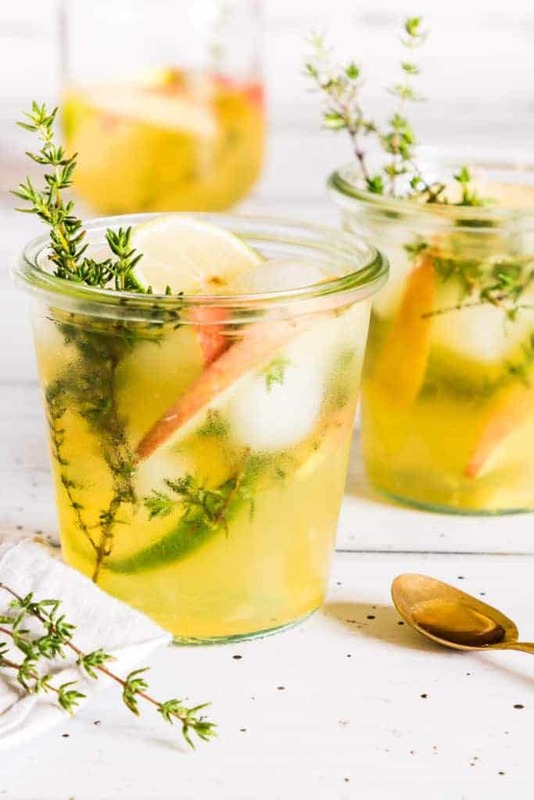 Garnish with extra apple slices, lime slices and thyme sprigs before serving. If you prefer to make this a whisky sour with honey then just swap out the maple syrup for some honey instead. Be aware though that it will not be a vegan drink any more. Want to make this a whisky sour with simple syrup. Easy peasy. Make your simple syrup and then use it instead of the maple syrup. Spiced Gin Apple Pie Cocktail. 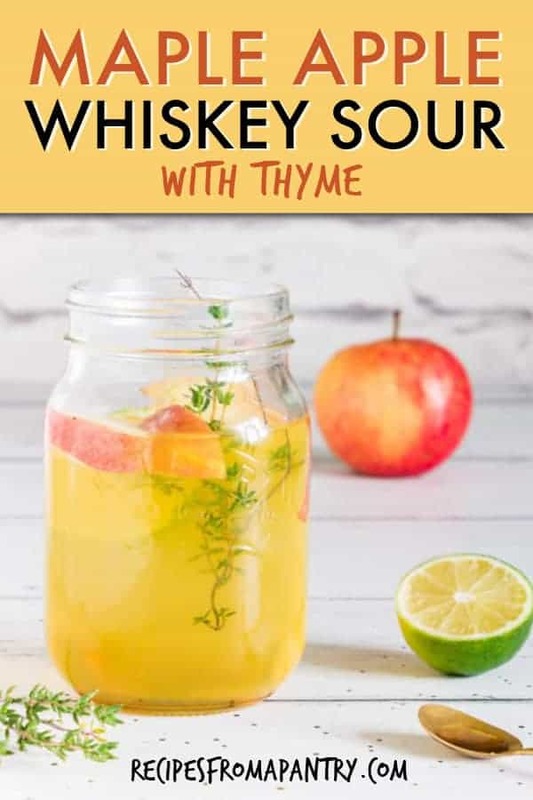 Thank you for reading my thyme maple apple whiskey sour recipe post. And please come visit again as I continue dreaming up recipes, traditional African recipes, African fusion recipes, Sierra Leone recipes, travel plans and much more for you. Thanks for reading Recipes from a Pantry, UK food blog. Don't forget to tag #recipesfromapantry on Instagram or Twitter if you try Maple Apple Whisky Sour! It is really, really awesome for me when you make one of my recipes and I'd love to see it. You can also share it on my Facebook page. Please pin this recipe to Pinterest too! Thank you for reading Recipes from a Pantry. 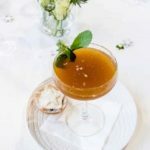 This Maple Apple Whisky Sour Cocktail offers a fun fall/autumn twist to a classic Whisky Sour and is whipped up with just 5 ingredients. Mix the whisky, apple juice, lime juice and maple syrup in a jug. Then add in the thyme and let infuse for 5 mins. Fill 2 glasses with some ice and pour in the maple apple whisky sour. Garnish with extra apple slices, lime slices and thyme springs before serving. I just tell you that the base idea of this whisky sour cocktail came from browsing cocktails recipes over at thebar.com. 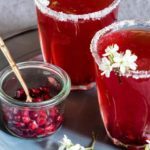 Their huge range of fantastic classic cocktails are a great place to look for drinks to whip up for parties, suppers and more. The recipes are a great starting point from which to add your very own twist or two to your cocktails. From mojitos to cosmopolitans and from margaritas to Tom Collins, they have got everything you need covered. Why not head over to thebar.com and check out their rather fabulous offerings. Also find out more about them on Twitter: @thebar_gb and Instagram: @thebargb. Oh this is so pretty! 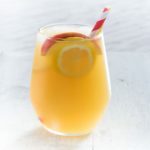 It sounds delicious – I love apple juice in cocktails. My husband loves whiskey sours so I’m definitely going to share this recipe with him! Perfect for fall! I would love to try this without the whiskey. Looks so refreshing!! Is it too early for a cocktail? Yes as it’s only 2pm but I so want one of these now. I love this! I have to admit it brings back memories for me. When I was growing up my mother loved to sip a whiskey sour while she was cooking dinner. None as fancy as this though. I so so love this – the flavors are so enticing! I don’ have any whisky but I’m gonna give this a try with some bourbon instead! 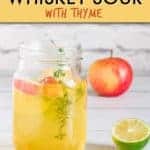 My husband is a fan of whiskey and this cocktail has all the trademarks of a perfect fall cocktail. Yummy. Your maple apple whiskey sour looks so delicious!! I love all types of whiskey sours and your version is superb! What a good looking drink!